Back in my CB days I was surprised one day to hear a guy telling me he was broadcasting from Canada. Then I found out all about "skip". How some atmospheric conditions let you hear people from around the world. Hmm. I think I'll hide my whole CB story here for now. My experience with CB radio starts in 1974 when I got my first set of real walkie-talkies. From my room I could hear people talking about being on interstate 76, which is the Schuylkill expressway. Most of the trucker talk was not interesting and no matter how much I yelled nobody ever heard me. Until one day this girl answered. We went back and forth with “who are you” and “no you tell me first” until I found out it was a friends kid sister 3 houses away. That’s when I found out the truck drivers were on CB’s. My father got our first CB radio sometime in 1975. 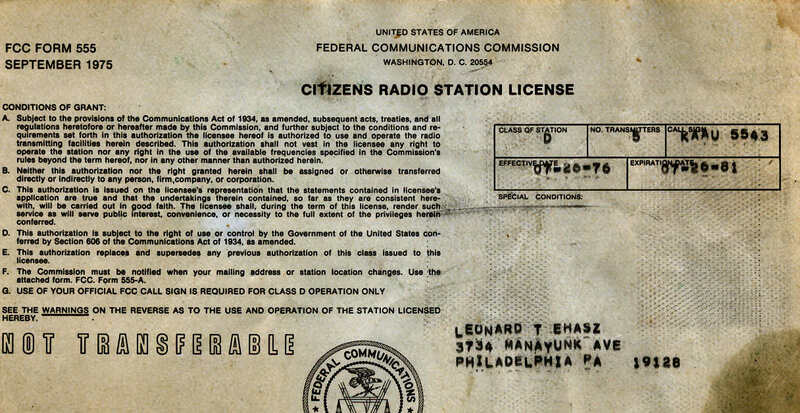 That was back before there was a CB craze and you still needed to get a license. Ours was KAAU5543 and I still have it. He would turn it on when we were going on our little trips. Listening to the trucker’s talk about the traffic and where the Smokey’s were. In the summer of 1976 we had the radio on a trip up to Watertown NY. My dad was talking to some other guy that was also heading to that area with his family. My dad was going to let me talk once I came up with a handle. The only thing I could think of was Catfish. I found out that other guy had a daughter who was my age. So we started chatting about whatever it was two 14 year olds would talk about with their parents listening, probably about music. They were several miles ahead of us and I think we talked for almost an hour. Then she told me they were stopping for lunch at a rest stop and she wanted to know if we were going to make a pit stop also. The parents thought it would be real cute if we met. Then we could exchange addresses and become pen pals. Oh joy. Her father told my father they had a van and where they parked and 5 minutes later we were at the rest stop pulling up along side a big old van with Canadian plates. Out pops this girl with big glasses, ponytails, braces, lots of freckles and she was as tall as me. We went inside. Hit the bathrooms, exchanged addresses and got some snacks. Her family was stopping for lunch and we were heading out. So she made me promise to write and we said goodbye. A couple minutes after we got back on the road I hear Catfish, catfish are you out there on the radio. It was her saying things like don’t forget to write. My mother at that point decided CB people were a little crazy. Spring of 1977. A buddy of mine got a power supply for his mobile CB and we were trying to mess around with it in his basement. We had it clamped to the faucet outside the basement window. We were goofing around with people because they couldn’t tell where we were coming from. That’s when I heard a faint voice of a person that would become my Muse for years to come. It was a girl named Lisa and she was sneaking on to her dads CB and also goofing around with people. Somehow even with the faint transmission we hit it off and I got her phone number. Two weeks later I walked the 2 and a half miles to her house to meet her. Her birthday was the same as mine but a year younger. I had a sneaky feeling she was younger than that. Confirmed in 2002 when I found her email address and she admitted she was really 12 when we met. I was 15 so it really wasn’t that bad. Anyway, I could write a whole book on Lisa as I tried unsuccessfully to hook up with her for the next 4 years. I used to write her letters even after I got married but never sent them. She told me I did actually send one in 1983 and told her all about me wondering if the new family I had was driving me crazy. Yeah, But lets get back to 1977. I turned 16 in September and got a car in November and my father got a new CB and gave me the old one to put in my car. The CB craze was just starting then. Seemed like almost everybody was on the radio. Everybody knew everybody. My girlfriend broke up with me to go out with a friend’s brother and I was trying to hook up with his sister and since we were all on the CB it was like one big soap opera. That’s the way things were going in 1978. I was meeting lots of people. I Stopped hanging out with the car-less crowd. It was springtime. She came on the CB one night and had the sweetest sexiest voice we had ever heard. She went by the handle Qantas and would not give her name. There was a lot of speculation, mostly by the other girls on the radio that she was faking the voice and because she had all the guys wrapped around her little finger. One night I convinced her to give me a call on the landline. That’s a phone in case you didn't know :) Her voice was even better on the phone. She told me her name was Arlen just like the senator. I had my suspicions it wasn't her real name. This phone call with Qantas started at like 10 at night and lasted until 5 in the morning. And to my surprise her voice did not change much when she got tired. She may have vamped it up a tiny bit on the CB Radio but after 7 hours on the phone I was convinced it was her real voice. Now Arlen, or Qantas as we all called her remained a mystery. Based on signal strength we knew she was in the Penn Valley, Gladwyne, Narberth area. At the time almost all the regulars on channel 20 would get together and party like it was the 70's. And the talk among the guys turned to the mystery girl Qantas. Back then we used to play a game where one CBer would park his car somewhere and three people would go search for them. The target would broadcast a message every 30 seconds or so and the object was to find them as quickly as possible. We all had CB's in our cars as well as at home. The rules only stated that the target had to park on a public street. No hiding in a driveway or parking lot. The chasers would talk to each other and based on signal strength you could tell if you were getting closer or moving away from the parked target. A good CB had a little meter on it so three people coordinated in a triangle could find anybody in less than 20 minutes. A month later after one of these parties we did something really stupid. We went looking for Qantas. A couple of us headed over the green lane bridge. One through the back way through Belmont Hills. One over Rock Hill Road. And one up Belmont Avenue, past the cemetery to the next street. We were on a different channel than Qantas was talking on. And we started west. Within 5 minutes we thought the signal was strongest in the middle. But someone had told her on the radio that we were looking for her. She got extremely upset and told us all off and then wasn't heard from for a couple weeks. And then only popped on 2 or three more times and was never heard from again. Started senior year of high school that year. Was also in electronics classes at the Vo tech. I really put my mind into that class. I was also putting together a killer CB to go with a new roof antenna I had just gotten. I was trading spare parts I was getting from school to a buddy for work he was doing on my CB. I bought a stock 23 channel SSB unit for dirt cheap that he was upgrading with extra channels. There were a few of the normal channels between 23 and 40 but there were also 4 special channels below 1 and 4 more above 40. So I was able to dip into the top of the 10 meter band. And some at the bottom of the 11 meter band. One guy I know was telling me about getting QSL cards from all over and asked me if I wanted to share his P.O. box for half the cost. And so another obsessive compulsive collecting habit was born. My best friend at the time was a 29-year-old woman named Jeanie. Besides school I spent hours on the CB every night talking to a group of about 30 people. Spring of 1979 my car was dying and my high school days were coming to an end. I had QSL cards out the wazoo coming into the P.O. box. Actually after selling them in 2005 on eBay I realized there were only 200 of them. But back then I had them all over the place. The summer of 1979 was an obsessive-compulsive nightmare that was the strangest time of my life. I was in college skipping remedial classes I didn't really need but had to take due to the scholarship grant I had. I was getting extremely philosophical about life. I would listen to the soundtrack to Rocky Horror and get stuck on the “don't dream it be it” part. One of the things I really liked to do was play video games and I had found a secret spot to do it. Instead of going up to the arcade at the Plymouth Meeting Mall I would go over to the game room at the Marriott Hotel. This is where I met someone that I did the craziest thing in my life (Up to that point) to see again. I met three girls in the Marriott game room in July of 1979. From that initial weekend, to my 18th birthday 9 weeks later, I was on a quest to make $300 so I could go to Mansfield Ohio to see one of the girls from the Marriott again. After selling posters and albums and my lava lamps and strobe lights and getting my parents to give me $80 for the bus ticket as a birthday present I was still about $100 short. I sold my CB that was worth about $250 for $100. Labor day weekend I was on a bus for 13 hours heading to Ohio. My father dropped me off at the bus station at 6am and said have fun. The QSL cards were still coming in then but I wasn’t into it much anymore. Here are the pics I used for the auction. People know what 73's and 88's are.